Photo Carlos Morales Greensboro, N.C. – Principia built a 22-0 lead against the University of Wisconsin-Stout in the Cup Final Sunday afternoon at MacPherson Stadium and went on to win 27-12 to be crowned the first Men’s Open Division champion at the 2013 USA Rugby College 7s National Championship. Consisting of eight Division II and small college teams, the Men’s Open Division is new to the College 7s National Championship. Principia defeated Emory and Lafayette College by large margins on Day One Saturday before losing to James Madison 12-10. With the 2-1 record, the Thunder Chickens moved to the Cup competition against Sonoma State, which resulted in a 19-5 victory. UW-Stout could have been considered the favorite to win the championship because of its 3-0 record after pool play and a 24-15 win against Lafayette in the Cup Semifinal. The Blue Devils found Principia too much to handle, however. The two tries scored could only be seen as consolation after all was said and done. Lafayette moved into the Plate Final after its loss to the Blue Devils, only to have the Sonoma State Seawolves score 41 unanswered points. Timothy Brophy scored two tries in the win. New Hampshire and Sonoma State drew 19-19 in the final pool match before the Bowl Semifinal against James Madison. The Wildcats beat the Dukes 21-15 and then defeated the Elon Phoenix in the Bowl Final. The Dukes moved into the Shield Final and held on for a 14-12 win against Emory. 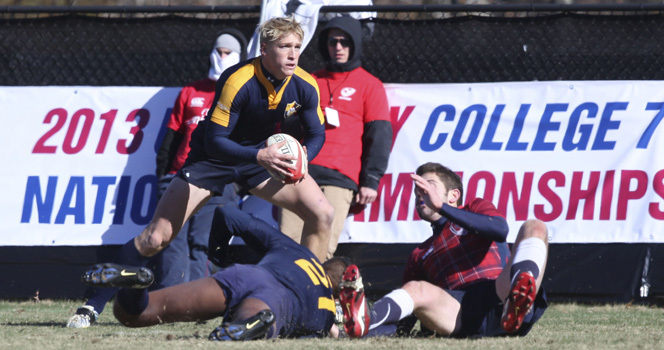 Watch the replays of the 2013 USA Rugby College 7s National Championships on the USA Rugby TV YouTube Channel. The Men’s Open Division All-Tournament Team will be selected in the coming days.